I just came across this very cool little robot, the Swashbot by Crabfu. This robot demonstrates an awesome sense of character from such a simple design. Its mechanics are primarily from an RC Helicopter, using 4 micro-servos and the RC receiver. 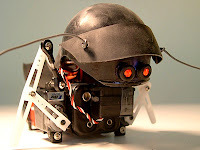 Crabfu's site has two fantastic videos of Swashbot in action, including the obligatory interaction-with-my-pet video. Although the walking pace is rather slow, the robot has a very smooth motion and as I said already, an amazing character. Crabfu's other creations include an amazing series of steam-powered walkers/crawlers/rollers (here) including the Steam Spider, Steam Beetle and Steam Horseshoe Crab.